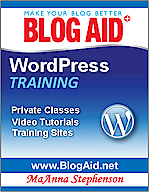 You’ll be training on a private site that is loaded with WordPress. In other words, it’s the real deal on the real thing and you’ll be creating a real site. And I’ll be with you every step of the way. You’ll know what you’re doing and why. You’ll be expertly qualified to choose a theme that enhances your content instead of competing with it. You’ll understand content marketing and how to place and format your most important elements for maximum exposure. How much is it worth to you to be a confident, successful site owner? There are no gimmicks; just plenty of solid techniques that you’ll learn how to master. One lesson builds on another and you’ll hone the skills you learned in class while you create your real site. If you also need hosting, look for the deal sweetener in the yellow box. Get the BlogAid Cyber Monday Special now! but you have to purchase today to get on the schedule at this discount price. Preferred dates are first come, first locked in.